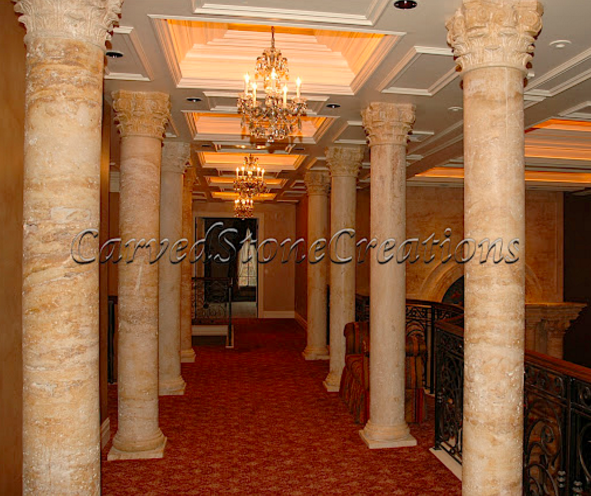 Columns take an ordinary room and transform it into an architectural masterpiece! You can incorporate stone columns indoors and outdoors in a variety of ways. Take a look at these three ways to add columns to your home to get inspired. There is nothing more grand than a hallway lined with columns on either side. In this design, the columns create a defined hallway space while still keeping an open feel. These classic columns are topped with an intricate carving to bring the whole look together and complement the homes design. Open-concept spaces are popular, but sometimes a more defined space is needed. Adding columns between two spaces keeps the open-concept feel while separating the rooms. This design features three columns, but one column on either side of an entryway is another popular design option. Instead of boring pole supports for an outdoor overhang, use sturdy stone columns instead. The design will give more architectural interest to the space while functioning as support. This design features three columns that accent the overhangs arch details. Columns are the perfect finishing touch to any space. They add beautiful architectural elegance to your home! Contact us to learn more about our stone column options.